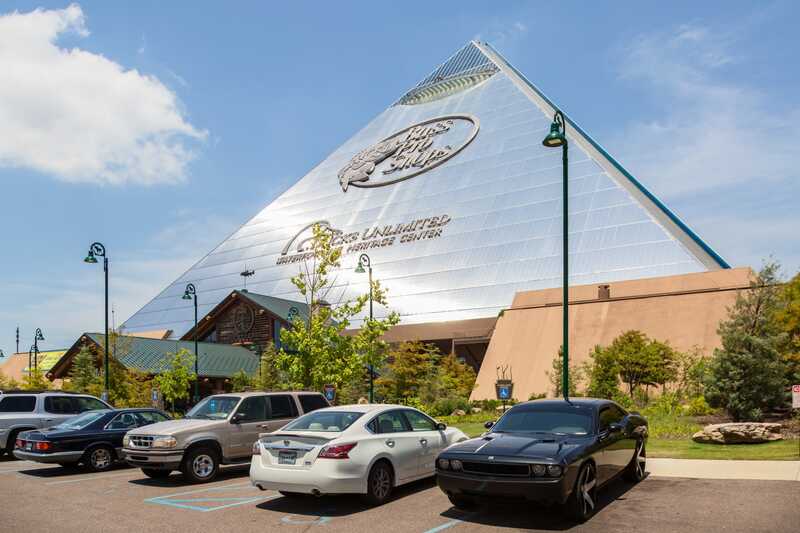 One of the largest pyramids in the world is in Memphis, Tennessee, and is owned by Bass Pro Shops. The „Great American Pyramid“ is taller than the Statue of Liberty and houses a super-sized Bass Pro Shops, a hunting lodge-themed hotel, an indoor swamp, a bowling alley, and two restaurants. We visited the pyramid and discovered a place that is like nothing else on the planet. An ancient pyramid looms over the city of Memphis. Well, maybe not ancient. But, since 1991, the „Great American Pyramid“ has welcomed travelers as they journey over the Mississippi River on I-40. And, the pyramid boasts a strange history, with a past life as a sports arena, events space, and even an abandoned structure nicknamed the „Tomb of Doom“ due to rumors of a curse incurred by the founder of the Hard Rock Café. Inside the mighty pyramid, the scene grows even more bizarre. The pyramid is now owned by Bass Pro Shops, and the chain has taken it upon itself to transform it into a sort of theme park for the American outdoorsman: a 32-story building with an indoor swamp, gun range, and bowling alley. Once you enter the „Tomb of Doom,“ you can never leave. Well, you can, but with a luxury hotel and two restaurants, there isn’t much reason to do so. The pyramid sits on the Mississippi River. It’s the first thing you see when you enter Memphis from the west. Since Memphis‘ namesake is the ancient Egyptian city of Memphis, the Tennessean city thought it only right to build a pyramid of their own in the ’80s. It cost a whopping $68 million, the equivalent of more than $124 million today. One of the original funders was arrested for failing to foot his portion of the bill, but the city managed to complete construction in 1991.